What is an antenna distributor? What is a combiner? These questions aren't as cut and dried as they seem, especially to someone new to A/V and wireless audio. It's not rocket science, true. 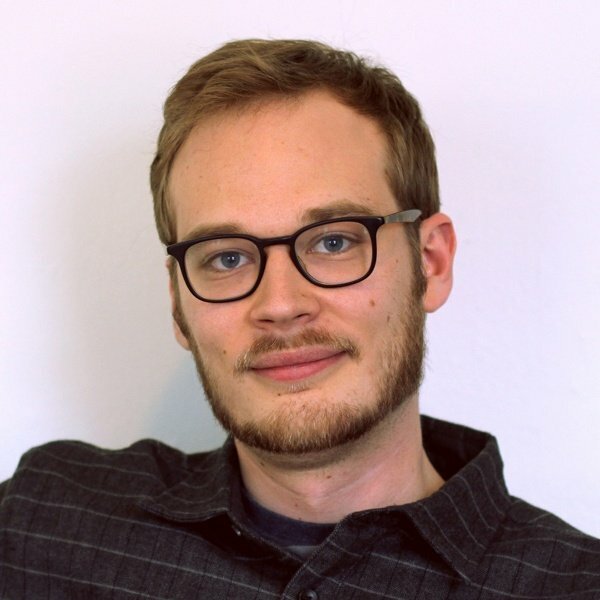 But it gets confusing because our vocabulary on RF distribution has been borrowed from other industries, like telecom and broadcast, and terms aren't always used consistently. 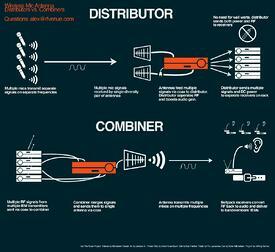 Here is a guide to what RF distribution and combination means in the A/V world. Distributors are sometimes called “splitters,” “distros,” “D.A.s,” or “distribution amplifiers.” But they all do the same thing. Wireless microphone antenna distributors receive multiple microphone signals through a pair of antennas, split and amplify those signals, and send each signal to their respective receivers via coaxial cable. Many distributors will also supply microphone receivers with their own power supply via coax or, like our 4 channel distributor, through dedicated DC jacks. This avoids the hassle of a rack cluttered with six, eight, or even dozens of whip antennas, and power strips practically smoking with a garden of wall warts. Crowding a large number of antennas together isn’t just an eyesore, it also increases the likelihood of intermodulation distortion and other problems. And if you want to use directional antennas (like paddles or helicals) with more than two receivers, an antenna distributor is a basic and necessary piece of gear. 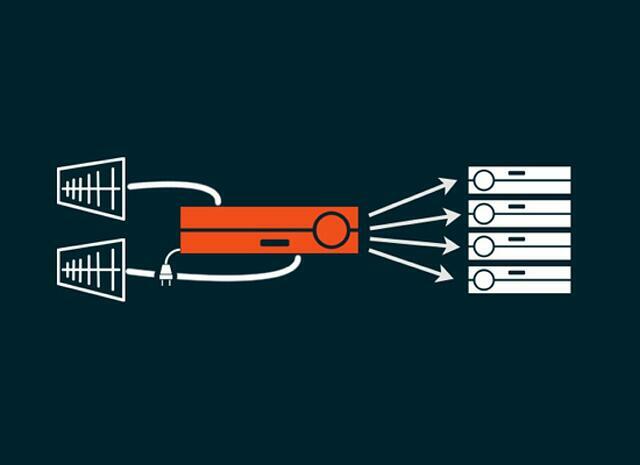 Distros can be daisy chained together for eight, sixteen, or however many receivers you need to accommodate. Amplification of the incoming signals is one of the key reasons to use a dedicated distributor instead of a series of unpowered signal splitters. As the feed from an antenna is split in two, the signal amplitude decreases. Without proper amplification, the uncorrected levels delivered to the system can be too low, resulting in dropouts and decreased range performance. 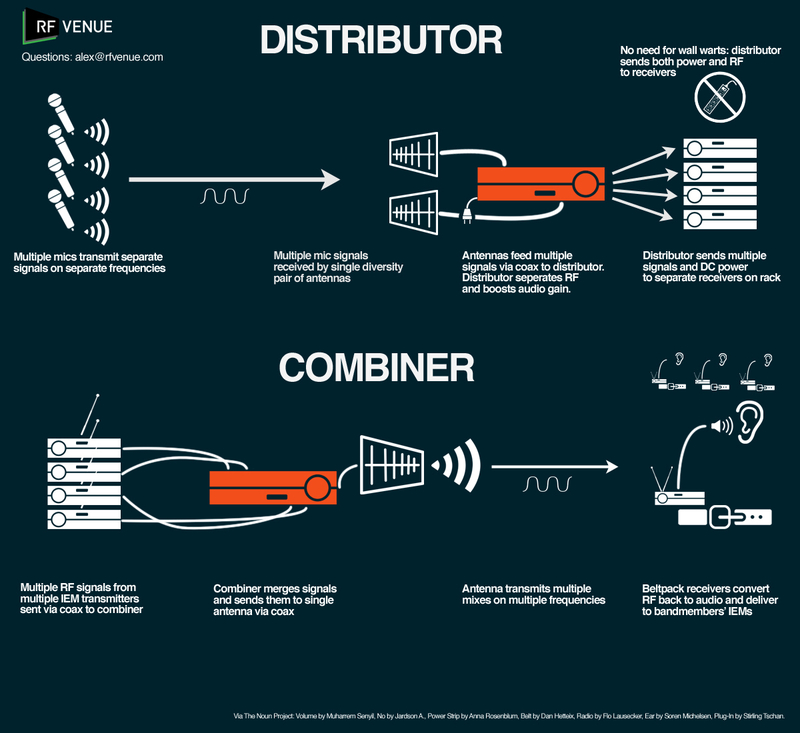 The conventional way of identifying distributor configurations is unique in the A/V industry. Because nearly all mic systems use diversity reception, the number of audio channels is not the same as the number of physical connections supplied by the device. For example, a distributor with a 1:4 input to output ratio has two coaxial inputs (for each half of the diversity antenna pair) and eight coaxial outputs (to route each half of each channel to four receivers). Take a look at the diagram from our rackmount distributor. 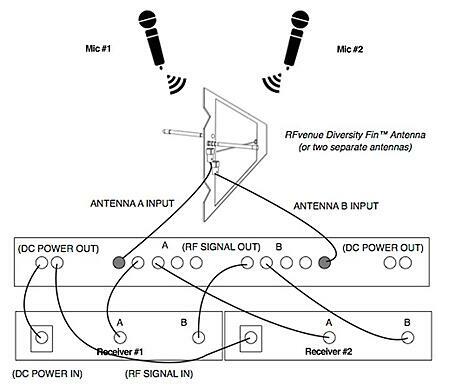 A distribution diagram for distribution of two microphone systems. RF combiners are used in the A/V world for pushing multiple IEM transmitter signals through a single antenna. They solve the same problems as distributors, except the signal path is reversed--instead of passively receiving multiple signals through one antenna pair, they actively send multiple signals through a single antenna. For live sound applications where each member of a band has a custom mix routed through an individual IEM (in-ear monitor), combiners are essential components. They reduce clutter at the rack by eliminating whip antennas, provide DC power, and reduce intermodulation caused by antenna farming while allowing the technician to directly focus a beam of RF directly at the stage--assuring all talent receives their IEM mix interference free.